Maingear’s massively powerful eX-L 17 gaming notebook plows through even the most demanding games like a freight train. Maingear slid the eX-L 17 onto the market in July with the brazen claim that it was the fastest 17-inch notebook on the market. While we can imagine that someone, somewhere has a 17-inch notebook with a tow-along liquid nitrogen tank that makes that claim bunk, we rest assured that the eX-L 17 represents the absolute bleeding edge of portable speed on the stock side of things. Like the Bugatti Veyron of gaming notebooks, you’ll pay a pretty penny for the privilege of ownership, it may singlehandedly melt a glacier when you fire it up, and 99 percent of the time you’ll never push it to its true limits… but when you do, it’s worth every penny. They say “it’s what’s inside that really counts,” and with gaming notebooks, that’s actually true. Our review model featured Intel’s top-tier Core i7 940XM coupled with ATI’s Mobility Radeon HD 5870 GPU, which sports 1GB of GDDR5 RAM. That combination alone is enough to blow most other notebooks out of the water, but Maingear also stepped it up with 8GB of Kingston DDR3 memory, and two 160GB solid-state drives folded into a RAID 0 array, which increases access times by allowing the system to read and write from both simultaneously. As the name suggests, it all slides in below a 17-inch LCD display with full 1080p resolution, and Maingear has also added a Blu-ray drive for putting all those pixels to work in movies, too. Tally it all up, and the $1,899 starting price for this model goes to $4,746, as equipped. If the monolithic black chassis on the XL-17 looks familiar, that’s because Maingear shares the design with a handful of other manufacturers. Like most boutique outfits without the sales volume to justify tooling for their own designs, Maingear uses generic cases from OEM manufacturers – Clevo in this case – and loads them out itself. Fortunately for those who prefer a bit of character in their hardware, like gamers, Maingear also takes steps to set itself away from the pack with custom laser-etched lids. Besides the four free designs you can choose during the order process, you can also drop an extra $100 to send Maingear your own artwork, which the team will work with you to perfect for the laser-engraving process. The final product stands out as smokey gray lines across the matte black lid with a superfine dotted effect upon closer inspection. 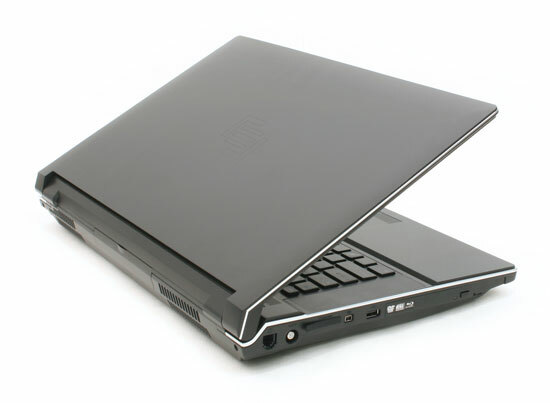 Custom graphics aside, the eX-L actually offers very subdued character, for a gaming notebook. Every inch comes swathed in untextured matte black, with only a thin trace of silver around the edges to set it off. We actually prefer it to the likes of screamy gaming notebooks like Gateway’s FX Series and many of Asus’ Republic of Gamers light shows. If the size doesn’t draw too many stares, it will even fit in just fine at a business meeting, providing you don’t opt to have a half-naked elf and a dragon etched on the lid. While its colors and design are unimposing, its posture is not. 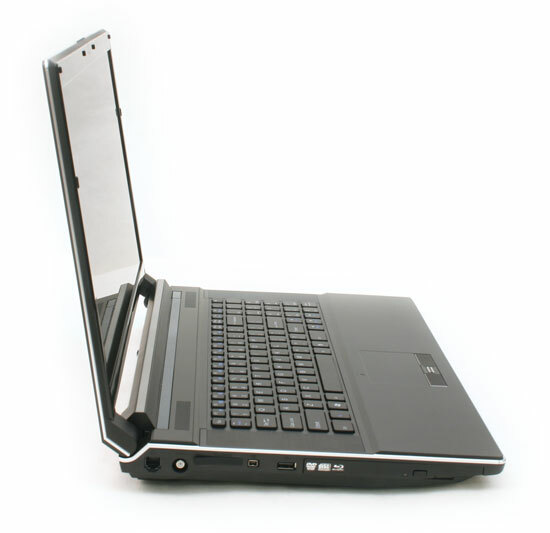 The 17-inch screen gives the notebook a desk-dominating footprint, and it towers about 1.75 inches tall when closed, though rubber feet boost total height to over 2 inches when seated on a desk. As equipped, our unit also tipped scales at 8.6 pounds, though that’s actually on the reasonable size for a machine with this much power. It’s worth noting, still, that you’ll have a tough time finding a traditional notebook bag that will carry this much ‘book, and the power brick, which is an absolute necessity, will add even more bulk. As a true desktop replacement, the eX-L 17 offers just about every port and connection you could possible ask for. Unfortunately, some of them end up squirreled away in the least convenient of places. On the left, you have your phone jack for the modem, CATV jack for TV in, an SD card reader under an unsightly rubber flap that doesn’t sit flush, a FireWire port, a USB port, and a tray-loading Blu-ray drive. On the right, you have a DVI output, eSATA jack for connecting ultra-fast hard drives, another USB port, an ExpressCard/54 slot for add-ons, as well as a headphone jack, microphone jack, line-in jack, and the rather rare digital line-out jack, which could be useful for connecting the eX-L 17 to a high-end sound system. Here’s the rub: You’ll find the most frequently used jacks, including the power connector, Ethernet port, two extra USB ports and the lone HDMI output, in back, hiding behind behind a flip-down plastic door that feels about as sturdy as the hood on a Matchbox car. We understand the logic behind hiding some ports when they aren’t in use for aesthetic appeal, but putting the most necessary ports – including the power jack – behind a door pretty much means it will always be hanging open. When it is, it looks even worse than a bunch of bare ports would, not to mention threatening to break off every time you lift or readjust the machine. We managed to keep the door intact with ginger handling of our review unit, but take it to a few Mountain-Dew-fueled LAN parties, and we wouldn’t give it past a few months. Our advice if you buy one: Break it off right out of the box and spare yourself the anxiety. All petty misgivings about this Maingear’s annoying rear door evaporate in a flash when you open your favorite games. They’ve never looked this good away from an air-sucking desktop rig. The eX-L 17 made short work of all our usual fodder for taxing gaming rigs. MotoGP08 looked nearly photorealistic with every detail setting on high, and the eX-L 17 still managed to peg the maximum allowed framerate of 60. Even after enabling 4x anti-aliasing, it took a screen full of racers and scenery to get the framerate to drop below 50, if for only a slight moment. We moved, instead, on to BioShock. Like MotoGP08, the surreal sci-fi shooter gave the eX-L17 no challenge to speak of. Framerates routinely hovered in the upper 50s, and only the most cinematic effects, like a game opening-shot of a blaze on ultra-realistic water, were able to get it to even dip into the 40s. Naturally, it was time for Crysis. Even starting out with all detail settings on high and the resolution at 1080p, the eX-L 17 pumped out a consistent 32 frames per second – right where it needs to be for silky smooth, uninterrupted playability – and a feat that not many laptops can claim to handle. Enabling the “very high” settings, which seem more like a challenge from the developers to crush hardware than a real addition to gameplay, sags things down a little more, with consistent framerates hovering around 20. Throw 8x antialiasing on top, and you’re down to 15 or so. But keep these numbers in perspective: A laptop still moving after piling on such high settings in Crysis is like the computational equivalent of a Mazda Miata towing a yacht. Even Gateway’s powerful P-7801u FX Edition choked with the starting settings we used on the eX-L17 -a triumph Maingear can be proud of. On the desktop, the eX-L tosses productivity apps around like toys and makes short work of video all the way up to 1080p, but the real benefit comes from those solid-state drives running in RAID 0, which cut load times to near-instantaneous for just about everything you can imagine. The machine boots to the desktop in just 38 seconds, and opens a browser window within the same second you can see the shortcut – a far cry from the typical 10-to-20-second delay most Windows 7 machines exhibit. The same goes for menus, media, and even carries over to games: The blazing-fast SSDs scythed Crysis’ typically snoozeworthy load times down to about 20 seconds. Benchmarks don’t nearly tell the real performance of this machine. It scored 12,387 PCMarks and 8,881 3DMarks in respective tests from Futuremark. While neither is anything to whine about, its in-game performance tells far more. The eX-L 17 will play whatever game you want, however you want to play it.